I was So Thrilled to Post This Book Review…and Now I Feel Like a Complete Jerk because I Did! As some of you know, some of my best books read and reviewed (in my opinion) are the ones I stumbled upon, chose to read, and am grateful I did. I will say straight-off that I do belong to a free ebooks website, and get 5 books a month through there. I also pick up random books at Barnes and Noble in their clearance bins, and buy books through Amazon because I like the cover. I put myself out there (and many of you did as well), when I offered to read, edit, and review your works for free. I have met some amazing authors, made some great literary friends, and am glad I could help out others in a way that means so much to me! Last month while perusing my free ebooks, I came across a story that I had to get. 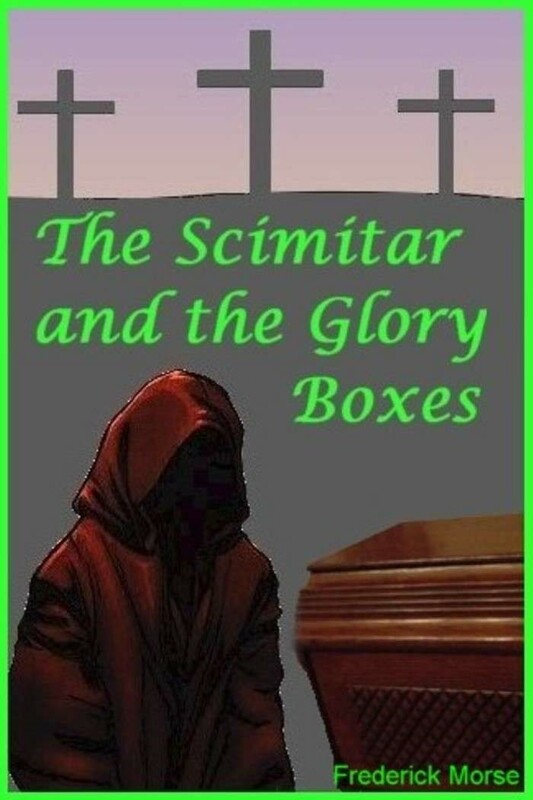 It was “The Scimitar and the Glory Boxes”, by Fred Morse. I love reading religious stories, factual, fiction, and whatever else may fall between the cracks. This story was fantastic, and I was so excited to post a review and also wanted to make sure I let Mr. Morse know. This book was too good to be on a free ebook site. For the past couple of years of doing this blog, I would often post these types of reviews; but it was as of late that I thought I really need to make sure these authors know their stories are being read, and appreciated. So as I have been so often doing now, I posted the book review, and sent an email to the author letting them know I reviewed their book, and included the link so they did not have to search for the review. And then I was checking my email. I will admit I was anxiously awaiting to hear from Mr. Morse, and hoping he liked my review. It was from his wife. He had passed away in September, and she wanted to let me know she appreciated me reaching out, and was happy I enjoyed his writing. So many things ran through my mind. I was sad I never got to communicate with this great writer about his works. I likely opened afresh the pain his wife was trying to control during the Christmas holiday season. And more than anything, was I looking for approval from someone whom I did not know because I liked their writing? I asked in my email that he let me know of any other books he had written, because I wanted to buy and review them. His wife was gracious enough to let me know, and with her permission, I will indeed be reading and reviewing them. I never ask favors of anyone, but I would truly like any of my followers who enjoy this same type of genre to look up this book and read it. You will not be disappointed! And to his wife, I would like to wish a Blessed, Happy New Year full of warm memories and comfort on how her husband’s writing truly did make a difference. It is the best 0.99 you will ever spend. What a good deed you have done. I am certain his wife will be forever grateful to you. When you lose a loved one, you don’t want people to forget them, but remember them and their achievements. Don’t regret it Angela, you’ve not only kept an Authors writing legacy alive, you’ve added to his wife’s pride of her husband’s achievements. Thank you so much! That literally brought me to tears. This is a story I want everyone to read! And to achieve a form of immortality. Please be sure to let me know what you thought of the story; good, bad, or indifferent! Angela, I’m pretty sure you provided a welcome distraction for the widow. At a time when she is probably overwhelmed with estate paperwork, phone calls, faxes, and forms – you provided a reminder that the husband she loved dearly was appreciated by others and that his writing lives on to make a positive impact. Everyone else has summed it up nicely. No need to feel like a jerk at all. I think your glowing review provided a bright spot in an otherwise dark time.